Men are detained behind the fence of the holding site in Debaga camp, Iraq. They are visited by their wives and children as they wait for Kurdish security to complete their investigation and clear them of Islamic State of Iraq and the Levant (ISIL/ISIS or Da’esh) links. The number of civilians killed in Iraq last month has nearly doubled since September according to recently released figures by the United Nations Assistance Mission for Iraq (UNAMI). The latest statistics reported 1,120 killed, up from 609 in September; and 1,005 civilian injuries, an increase from 951 in September. The figures include 15 deaths among local police and security forces as well as eight injuries. “The casualty toll among civilians continues to rise and the civilians continue to pay the ultimate price,” said the Special Representative and head of UNAMI, Ján Kubiš. According to the Mission, 672 people from Iraqi Security Forces – which includes police engaged in combat functions, Peshmerga, SWAT and militias fighting alongside the Iraqi Army excluding those in Anbar Operations – were also killed and 353 were injured. Baghdad suffered the worst casualties, with 268 killed and 807 injured. In Ninewa, 566 civilians were killed and 59 injured, 58 killed and 112 injured in Kirkuk, 16 killed and two injured in Salahadin, and four killed and two injured in Diyala. “With military operations in Mosul and other areas of Ninewa underway while Daesh continues to apply its terrorist tactics using civilians as human shields and executing those that resist, civilians are once again in harm’s way,” said Mr. Kubiš. “The United Nations again emphasizes that all actions necessary must be undertaken to ensure the protection of the civilian inhabitants from the effects of armed conflict and violence,” he urged. UNAMI has had difficulty verifying civilian casualties in conflict areas. Figures for casualties from the Anbar Governorate have been provided by the Health Directorate and may not fully reflect the real number of casualties due to the instability of the situation on the ground and regular disruption of services. In some instances, only partial verifications were possible. The Mission also received, and has been unable to verify, reports of large numbers of casualties along with deaths by secondary effects of violence such as exposure to the elements, lack of food, water, medicine, and health care. UNAMI has also been receiving reports of civilian deaths since the start of the military operations in Mosul and Ninewa, which have not always been possible to verify. The numbers presented here, therefore, should be taken as the absolute minimum. 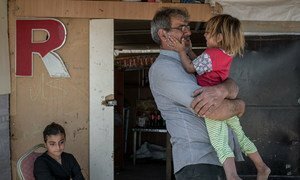 The United Nations in Iraq has reported that civilians continue to bear the brunt of the conflict in the country, with a more than 28 per cent spike in fatalities and a 17 per cent increase in injuries from August to September this year.